We invite you and your associates to experience some of the most unforgettable tropical venues in the Palm Beaches. Let us plan a fire-roasted South American Asado al fresco after a world-class polo match or high-stakes British croquet. Experience unique, exquisite cuisine served among vintage “ragtop” autos, tented under the stars in an enchanting botanical sculpture garden or enjoy a cocktail party casino cruise. Our corporate planning services include site planning, rentals and showcase décor, professional staffing and top entertainment that fit together perfectly for that designer look. After a hard week of work, a new promotion, or a sales goal your team finally meets—you plan a special getaway to for your team. Your management team needs to focus on strategic planning and revisiting your mission. You have selected the perfect location designed for a relaxed professional group. As a team-centered company, Aaron’s Catering realizes how vital it is for employees to interact with each other, exchange ideas in a setting free from daily distraction. No matter the department or position, we all work together to meet our goals and create successful businesses. Reward them in style with great food, service and ambiance. AftWhat better way to say thank you to your hard working loyal employees and their families than during the winter holidays—Thanksgiving, Christmas, New Year’s and Chanukah. The memory of that over-the-top endless buffet, holiday décor, priceless pictures from the photo booth and dancing to the DJ’s sound track will last all year long. We have delicious menus and prices that will meet your budget and project good will and spirit of generosity. 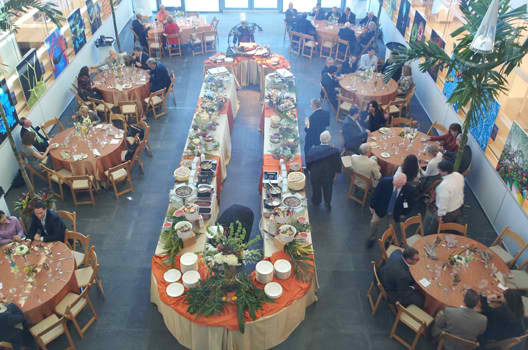 Have you considered a holiday party at your company site —inside or tented outside? Prefer a banquet facility–our venues are conveniently located throughout South Florida and can accommodate from 50 to 500—even with that dance floor!